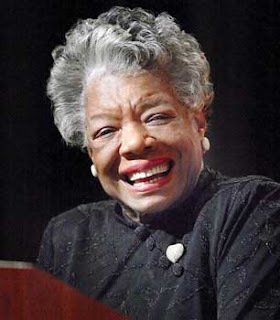 "All of the poetry belongs to all of us all of the time," Maya Angelou exclaimed in her booming, baritone voice. Maya Angelou is the perfect antidote to a crumbling universe and I was so lucky to see her last Weds. at Royce Hall. She is a poetry pusher - insisting we connect with our librarians to help show us the way. She recited words from Paul Lance Dunbar, Mary Evans, Edna St. Vincent Millay, Nikki Giovanni, and William Shakespeare. She said, "Poetry helps us be who we're supposed to be." The event was supposed to be held in February and I was worried that perhaps she was in ill health when it was pushed to March. Nope. Nothing of the sort. Turns out the date just conflicted with picking up the Presidential Medal of Freedom. Phew! She even brought the medal to show us. At 82, she is still going strong. Having just taught "I Know Why The Caged Bird Sings" last semester, I was thrilled when she started talking about her family members, the ones portrayed so vividly in her book. She spoke about being raped at age 7 by her mother's boyfriend, and telling her brother, who told the family and the guy was put away in jail for one night and then beaten to death once he got out. Maya, thinking her voice caused his death, stopped speaking for six years. She was rendered a self-imposed mute. But her mom was right. A great teacher, poet, singer, woman, human being. I left the theater feeling exalted. i also miss Royce Hall!!! Phenomenal woman indeed. I'm a fan of Maya Angelou, too. I read her entire memoir series may years ago here in Australia and the writing stays with me. It's good to meet you here, I'm here via the revenge is the best writing site. Pleased to meet you. Nice to hear from you two, Daniela and Elisabeth! great post! this poem should be in high school classes everywhere.